JP Steel Plantech Co. has developed “ECOARC™”, a high efficiency EAF having the most advanced energy recovery and environmentally conscious technology in the Mini-Mill industry. 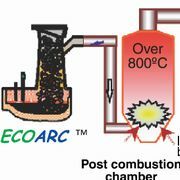 ECOARC™ uses high temperature exhaust gas for preheating scrap charged into “shaft type” pre-heating chamber attached directly to the furnace shell. In addition, the gas is used to treat unwanted chemicals from the waste gas in a combustion chamber with very little use of extra fuel. Only ECOARC™ has these features because of its high level air tightness to prevent air infiltration into the scrap preheating shaft and the furnace. Six ECOARC™ have already been put into commercial operation in Japan, South Korea and Thailand which have achieved approx. 30 % reduction of energy. In this paper, the method of improving energy efficiency by the utilization of waste heat is described and ECOARC™ under commercial operation are introduced. In this paper, we outline the ways to improve the energy efficiency by using the waste heat in the exhaust gas of steelmaking arc furnace, we introduce a high-efficiency arc furnace ECOARC™. To reduce energy consumption in the steel industry in Thailand, several model projects supported by the governments of Thailand and Japan were implemented. As one of them, an ECOARC™ was installed in UMC Metals Ltd. and started up in November 2012. The ECOARC™ is a high efficiency electric arc furnace with a scrap preheating system developed and designed by JP Steel Plantech Co. It was a brown-field project which replaces the existing conventional EAF with the ECOARC™, maximizing reuse of the existing facilities except key components of the ECOARC™, in order to minimize initial investment. After the start-up, all the targets of this project were achieved only within 2 months after the start-up in spite of the first and brown-field ECOARC™ in Thailand. 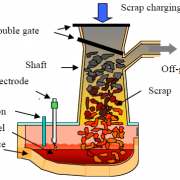 In this paper, the method of improving efficiency by using the rejection heat in exhaust gas the electric arc furnace for steel making is outlined, and it introduces highly effective arc furnace ECOARC™ introduced into UMC Metals Ltd. in Thailand as a model project of NEDO (New Energy and Industrial Technology Development Organization) that is the maximum public research and development support organization in Japan. In this paper, it introduces the technique to solve the following three environmental problems for the electric arc furnace (EAF) for steel making.